You see the Uchiha had control over the Kyuubi and I used the Kyuuubi to attack the leaf village and thats when it was selaed inside of naruto then while the clan was in a rush i seald the snake inside you. 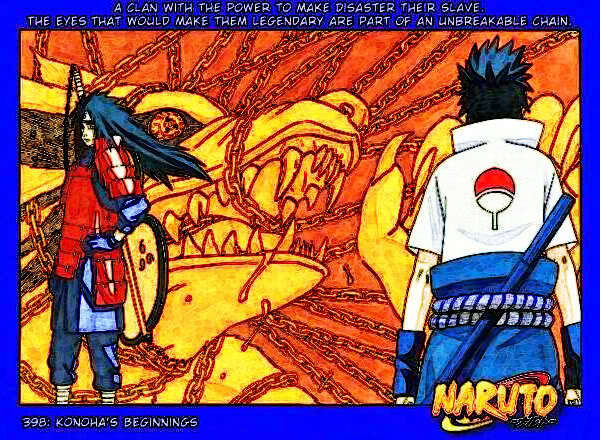 Since then the uchiha were blmaed for the attack. Thats why Itachi was ordered to kill them. The only reason why was becuz the uchiha were going to lead a revolt against the leaf then they sent Itachi was a secrect agent who was used to tell Uchiha Leaf secrects but he was a double agent who was feeding info of uchiha to leaf. Why? Becuz he as a young boy seen the death of the thrid ninja war. He didnt want that again so he help stop the revolt. Then he left his brother in the villages care. The Thrid hokage was the only one protecting sasuke. But when the Thrid died Itachi came back to the village telling the leaders that he is still alive and watching. His love for leaf never died he protected Leaf from the inside.